"In the Champions League, we now have to try and nullify the opponents some other way. Scottish teams are now in a situation where we are unable to compete with English clubs in signing the top players from all over the British Isles, unlike many years ago. So we have to try and find another way to succeed. "So, from our point of view, we are pleased with the determination and high level of concentration the players showed. They restricted Manchester United to very few opportunities." And, really, why should there be? I wrote before the game that a draw would be a brilliant result. I was concerned that Rangers needed to make sure that they didn’t lose an early goal. The 10 changes made by Alex Ferguson helped them, good as these players are, there was always going to be a lack of fluidity in the opening exchanges with such drastic shuffling of the pack. It was Rangers good fortune that United were unable to find that fluidity at any stage. So it’s not pretty to watch but it’s a system that works and allows Rangers to compete on what, as Smith himself has pointed out, is not a level playing field. We saw last year that when Rangers show a bit more adventure at home they can be undone by teams that are simply better than them. Why should they travel to the big European clubs and play a system that makes life easier for their opponents? Anti-football? Whatever, it’s a results business and you make your choices based on that. Given the disasters Scottish football has faced in Europe this season I’ll take last night’s parking of the bus at Old Trafford. Still a long way to go for Rangers though. A fair number of words written in the build-up to Manchester United v Rangers in the Champions League tonight. We've had the stories about Sir Alex Ferguson's boyhood support of Rangers, his playing career, his time at Aberdeen. Fergie has spoken with great fondness about Walter Smith, his right hand man at the 1986 World Cup and, briefly, at Old Trafford. Smith has responded with glowing tributes to his old boss. Smith and David Weir have admired Wayne Rooney and recalled their days together at Everton. Gary Neville has paid tribute to Weir for being old and still playing. Darren Fletcher has suggested that Smith isn't old enough to retire. Everyone has spoken of their confidence that there will be no repeat of the violence that marred Rangers appearance in the UEFA Cup final in Manchester a couple of years ago. A lot of interviews, a lot of creativity in the questioning, a lot of friendliness in the answers. But the truth behind the tributes, the respect, the old friendships renewed is that the game is a mismatch. The champions of Scotland and the runners-up in England continue to share an island but they inhabit different footballing planets. Results in some European domestic leagues this weekend suggest that shocks are still possible in football. But the modern game is as riven with class differences as a Victorian country mansion. Rangers hope, the Scottish co-efficient watchers hope, that United have an off night and Rangers somehow perform above themselves. But it seems a forlorn hope and Walter Smith can have travelled with few expectations. Sneak a draw on a brilliant night, avoid a drubbing on a good night. A win would be a fantasy come to life. Even in their financial mires the clubs are in different stratospheres. Rangers' debt of £30 million has turned them into paupers with championship medals. United's debt is said to be somewhere around £715 million but there is no question, at least not yet, that this is likely to unseat them from the top table of European football. Our footballing realities have diverged completely. A Scot watching English football, the money, the imports, the hype and the crowds, might be reminded of Bobby Jones' words about the young Jack Nicklaus: the English, it seems, are playing a game with which we are not familiar. But football is still a game. And the Rangers fans currently travelling in convoy from Wigan might just allow themselves to dream. It will be some effort, a Hercules-ian effort even. But, who knows, maybe dreams will come true. I can't see it though: 3-0 to United for me. 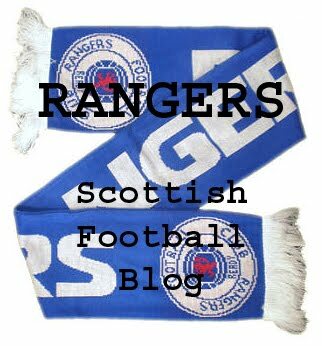 * Thanks to @CraigyAnderson on Twitter for this stat: Rangers last won a European fixture since beating Werder Bremen in the home leg of their 2008 UEFA Cup quarter final.